The New York City-based architect talks about the challenges and rewards of public projects, the value of competitions, and cross-disciplinary team work. ArchNewsNow (ANN): What inspires you to work on large public projects? Rob Rogers (RR) / Rogers Partners Architects+Urban Designers: As architects, we have the utmost responsibility when designing for the public realm. It's not only about individual client needs or desires or passions – it’s about a collective sensibility. Our work has to answer questions that the users of public space might ask, such as: “How do I take pleasure in public experience?” or “Where do I engage others?” or “How do I find a moment of solace, if that's what I want, within a busy city?” So that's where the greatest obligation lies. The architect becomes a cultural interpreter. In essence, we are seeking answers on behalf of thousands. Public projects have a broad impact, and because of this, they offer the greatest opportunities. Yet, they are expensive and take a long time because they’re part of the public process. That also means that they will probably be around for a while. I’m very motivated by the responsibility and reward of civic engagement. ANN: What makes public projects different from other project types? RR: The public realm is made up of those places that we share as a society. We know that our public projects have to engage the lives of everyone around us and, in some cases, even generations that come after us. We designed this wonderful project in Minneapolis with landscape architect Kate Orff and SCAPE to reorient a city fabric that evolved in relation to the Mississippi River. The milling industry harnessed the hydraulic power of the river and, over time, the industry edged up its banks. A series of water works extended hydraulic capacity deep into the structure of the city. The urban core of Minneapolis was dependent on this industry. After fuel technologies changed, it became less effective to build those waterways, and this area atrophied quickly. Our project, Water Works, converts the ruins of this industry into a recreational tissue that reintroduces a 21st-century city to the waterfront. It also creates connectivity across and down the river through interpretive programming about the ruins’ history, ecological programming about how the river has changed over time, and geologic interpretation about the mills’ limestone foundations that were created in the riverbed and quarried from that riverbed. Of course, we brought in contemporary programming – food and recreational activities, such as kayaking, biking, casual dining, and a place to stop and get a hot chocolate on a riverside walk. We inserted a building that cantilevers out over the park so you have amazing views of the St. Anthony Falls – the point of origin for Minneapolis – while solving access to the river and all its rich amenities. ANN: What are some of the greatest challenges designing for the public realm? RR: Really successful public spaces must have the flexibility for active, frequent programming. For example, we’re working at Constitution Gardens on the National Mall with PWP Landscape Architects. The Gardens were originally conceived by Skidmore, Owings & Merrill (SOM) and Dan Kiley in the 1970s as a public park to honor the Bicentennial. They were rushed through construction and ended up short on funds, so they never finished building a pavilion or fully realized the landscape potential of the site. We’re now working with PWP on a robust restoration of that landscape, along with the great lake at the center of the Gardens, to create an all-season park and place of respite on the National Mall. We’ve also designed a pavilion to support an extensive collection of activities. The pavilion can’t just be another food stand – it’s got to be something of its time, something that belongs on the National Mall. So we proposed a striking, thin shell of a building that sits in the foreground of the Washington Monument – in other words, an elegant low, long-span structure in front of the nation’s highest stone tower. It’s a contemplative place overlooking this ecologically vigorous landscape where visitors can go to honor our nation’s battles or occupy the site of the great civil rights demonstrations. Amidst the highly emotive areas of the Mall, visitors will now have a place to relax, contemplate, and play. ANN: What lessons have you learned from your work on these types of projects? RR: One of the biggest lessons that we have learned is that all kinds of projects can share the language of public space, even if it isn’t part of the program from the start. To cite one example, we’re just finishing a corporate headquarters for SandRidge Energy in Oklahoma City. Contrary to the initial presumptions of city officials and, I think, to many local residents, that corporations can’t make public space, we worked with the company’s CEO to figure out how the site could contribute to the quality of the city in generous and effective ways. At the time that we began the project, property was pretty inexpensive, and we made a very basic proposition to build more horizontally than vertically. We also decided to build multiple projects so that we could activate empty streets, take over empty sites, and enhance existing pedestrian patterns. We located a collection of buildings between the primary commercial and civic axes of the downtown. In so doing, we connected those areas not just with a collection of buildings, but with a collection of public spaces. This is why we call it SandRidge Commons: it is a place that serves the company, but it also serves the people of the city. We challenged expectations by actively addressing the city’s climate and difficult weather fluctuations; it’s often as hot as 110°F in the summer and well below freezing in the winter. We engaged Arup’s environmental engineers and performed micro-climactic studies. But we didn’t try to make the entire Commons comfortable all the time. Instead, we created some public spaces that are in the comfort range almost all of the time, and others that are comfortable at different times of the day and under specific seasonal conditions – such as when it’s sunny, overcast, when the wind is from the east, or wind is from the west, and so on. We find that people are remarkably adept at finding comfort, and they learn how the spaces perform during various weather patterns and at different times during the year. It’s delightful to see that SandRidge Commons has hosted everything from basketball rallies to weddings to barbecues, as people have embraced this new model for open space. Further, the spaces have had a great catalytic effect on adjacent real estate: vacancy rates have declined and rents have increased in the buildings that abut the Commons. The spaces and buildings have played an integral part in the revival of Oklahoma City’s historic core. ANN: What is different in terms of the types of materials you use for public realm projects? RR: Something that really fascinates me about public projects is that they almost always have – at least the way we do them – a distinct materiality that comes from the place, program, and problem, and not from the traditional practice of architecture. It’s an interesting exercise to understand how a certain project’s scale, character, and mass require different material resolutions. At Constitution Gardens, for example, we originally investigated using a steel structure or a progressive post-tensioned ductile concrete structure, but we’re also looking at high-tech compounds and carbon fiber to create the pavilion’s super lightweight long spans. Whether it’s the nautical bronze that we used for security elements at the New York Stock Exchange, or the raw industrial precast panels and translucent skylight material to build the Henderson-Hopkins School in Baltimore, we can convey big ideas, just from the materials. For instance, if a project is up against a highway, like the Syracuse Energy Campus, and if passersby are reading the building at 60 miles an hour, you can use materiality in a large-scale way. By contrast, the glass benches we designed for Battery Park City are scaled to the pedestrian, softly illuminating walkways and neighborhood connections. ANN: You’ve won several of your projects through competitions. What value does entering competitions bring to your practice? RR: Competitions are challenging as a business practice. Yet, they’re rewarding as an intellectual practice, because you get the chance to test ideas. We’ve done pretty well and won our fair share; most recently, we won The New St. Pete Pier in Florida, which projects a quarter mile out into Tampa Bay. Competitions, for us, are the equivalent of investing in research and development – they’re the way that we question our capacity and the abilities of our team. You can work at a whole variety of scales and typologies. You can also work on your ability to explain ideas. We do three or four competitions a year, and we build them into our budget because they’re fundamental to the practice. ANN: Lots of firms say that they are “cross-disciplinary.” What does it mean to identify your firm in this way? RR: The kinds of projects we are doing demand more capacity than just one or two areas of expertise. We’ve built a cross-disciplinary approach, which means that we put urban designers, architects, landscape architects, digital specialists, and graphics people on projects, whenever they’re required. Having this breadth of expertise in-house helps us to coordinate information, creativity, and innovation within the studio. And we constantly team with some of the most interesting practices throughout the U.S. in order to expand our own boundaries and presumptions. A project like SandRidge is emblematic of this approach, because it’s a combination of new construction and preservation, interiors, urban design, streetscapes, transportation, and landscape architecture that links to other things going on in the city. The team for our recent win, The Pier, includes Ken Smith as landscape architect, and two amazing local firms – Tampa-based ASD and Booth Design Group – as so much of the project demands intimate knowledge of local social programming and native ecologies. Our work together has produced a compelling proposal to turn a 19th-century retail icon into a progressive, accessible, and sustainable public place. We’re also connecting the urban and recreational features of waterfront St. Petersburg with the pier. For example, we’re integrating The Pier’s activities with existing bike paths, jogging trails, parking, and public transit systems. Essentially, we’re embracing the dual role of The Pier as both an icon for the city and an essential feature of the St. Petersburg waterfront. It’s our mandate to produce a really durable, long-lasting, long-lived amenity. So we’re partnering with engineers and scientists to explore every conceivable area of concern. For example, we’re mapping seagrass beds to ensure that the floating docks don’t cause any damage, and performing hydraulic modeling to test water flow and water quality improvements. We’re stressing environmental changes and adaptations that are legible and interpretive. The message is: get over the water, get to the water, get in the water. We’re deep in the process of design, programming, and science through partnerships with cool experts and sensitive public outreach. And it’s leading to a truly flexible armature of rich local and destination-based programming that marks St. Pete’s presence on the bay. Because of that, you could say that this project truly encapsulates our learning about public work, at least until we start the next one! Through significant new urban connections, and a recreational and educational pavilion, the Water Works park in Minneapolis will provide an all-season place of respite and delight right at the site of the city’s origins – St. Anthony Falls. Water Works weaves together heritage ruins, local ecology, and recreational systems into a coherent civic space on the Central Mississippi Riverfront. Constitution Gardens on the National Mall in Washington, DC. The light structure of the new pavilion floats above the pond. The new pavilion reactivates Constitution Garden as a vibrant public space. At SandRidge Commons, the public plaza helps to revitalize downtown Oklahoma City’s urban core and creates a new gathering space for employees. The approach to the SandRidge Commons plaza. At night, 3000K integrated LED strips illuminate the canopy, and yoke-mounted halogen PAR38 downlights light the plaza area below. The The New St. Pete Pier in St. Petersburg, Florida. The piazza combines a promenade and green space that rises to meet the horizon. Connected to St. Petersburg’s urban center, the pier will be a nexus for recreation and public events. 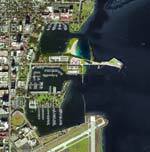 Site plan for The New St. Pete Pier. Reminiscent of a campus rather than a monolithic school building, the Henderson-Hopkins School in Baltimore is a cluster of “houses,” or flexible learning spaces, arranged around a central plaza. Each Henderson-Hopkins house has a Commons area for lunching and learning; translucent skylight material allows natural light to fill the spaces. The Henderson-Hopkins School plaza at dusk. The Syracuse University Energy Campus produces cleaner and more efficient energy through cogeneration. The plant is transformed into an amenity for both Syracuse University and local residents, with gardens for growing and kitchens for cooking and sharing.